It’s twilight on the tenth day of the month of Muharram. Husayn ibn Ali peers across the scorched desert at the Caliphate army, which was sent to prevent him from reaching the city of Kufa where allies await his arrival. The caliphate army had cut off Husayn’s access to the Euphrates river several days before, preventing not only any chance at escape but also the water supply; Husayn’s followers survived the Caliphate advances only to die now of thirst and dishonor. It’s dark all around. Everyone is weeping. Rhythmically they begin to beat their own chests. “Ya Husayn. Ya Husayn,” they repeat over and over. They are deeply sobbing and heaving each breath; their wailing stifles the air so one can hardly move. All of this takes place on the same night—just some 1,300 years apart. This is Ashura. 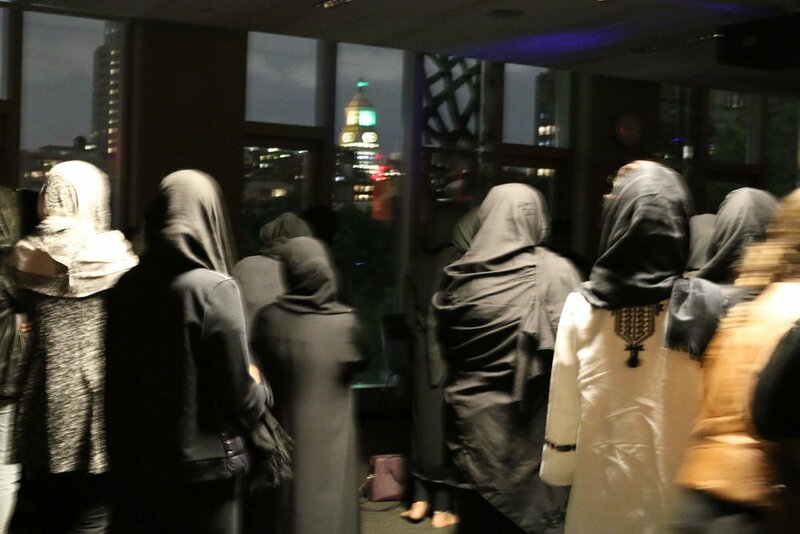 Women in New York City celebrating Ashura. || Photo credit to Maggie Ford. This story divides Islam into two primary sects: Sunni and Shi’a. But why? What happened? Political instability, the source of this conflict, was evident even during the times of the Prophet Muhammad. He tried to teach a pure religion capable of severing political bonds of jahiliyya (a tribal spirit of violence and terror) by uniting people under new, spiritual bonds. However, the prophet mostly dealt with hard hearts: The Umayyad leaders in Mecca were reluctant to leave the polytheistic religion of their fathers and their fathers’ fathers. Even Muhammad’s followers in Medina were often motivated more by jahiliyya politics than by repentance and spirituality; Muhammad often struggled to motivate them to ‘do the right thing’ because the jahiliyya mindset was so ingrained into their consciousness. To sever this bond would require the intervention of the divine spirit—the same spirit which filled Muhammad on his “night of destiny” and spoke the Qur’an through him. His life would become Jihad; he would try to win over the Meccans and to teach his own people that this Holy way of life was meant to transcend corrupt political structures. However, in 632 C.E. when the prophet died, he appointed no one to take his place as leader of the Muslims; and a vacuum is always quickly filled. The Shi’a response to the vacancy and political instability was to theologize it: the prophet’s own bloodline should fill the vacancy and become the first successor or Caliph. However, others opposed this view and held that it should be his closest friend and companion Abu Bakr. The tribal spirit of jahiliyya which Muhammad had worked so hard to vanquish, now crept back in among his own people. There was lasting unrest when the prophet’s cousin Ali was robbed of his right to lead the people. The men and women who followed Ali believed that the newly formed caliphate was of human origin and likewise it was corrupt. They were not satisfied even after Ali was made the fourth Caliph, since his successor was not of the same blood as the prophet. After Ali’s death in 661 C.E., those who supported him rallied around the prophet’s grandson Husayn, who had been inciting an uprising against the Umayyad Caliph Yazid I. Yazid I, worried about the impending division of Islam, sent an army to intercept Husayn and his followers before they reached the crucial city of Kufa where reinforcements awaited. When Husayn died, he was instantly regarded as a martyr by those who followed him. However, he was deemed a criminal by those who didn’t follow Ali and the familial Caliphate. This division was solidified in the death of Husayn. There were now two distinct forms of Islam. Sunnis do not regard the death of Husayn as having any spiritual significance; Shi’a mourn his death and await the prophet’s bloodline to come and redeem Islam. Some Shi’a believe that there is a descendant of Ali and Fatima who went into hiding and will one day return with the to bring order and establish true religion that the prophet Muhammad taught. In light of political developments in the Middle East and terrorist attacks on the United States, Islamophobia is a growing issue among many Americans and many Christians. By Islamophobia, note that I do not merely mean the American nationalists who believe that all Muslims are terrorists and are not to be trusted; instead, I am speaking of those who view Islam from a distance. It is not necessarily an unsafe thing in their eyes, but it is an unsure thing. These Christians do not accept the nationalist view of Islam as a threat, but they have not really formed a positive opinion either. Of all the things we might learn from Ashura, the greatest is this: as Christians, we have more things in common with Islam than we might ever have expected. Husayn died to preserve the teachings of the prophet Muhammad. Although as history has shown, he did not die in vain. Shi’a still honor his martyrdom each year; he is their example of what Islam or surrender to God looks like. This is similar in many ways to how we Christians look to Jesus as one who obeyed the Divine Will even to his own death. Jesus taught his disciples to pray, “not my will but yours be done;” Husayn taught the Shi’a to submit themselves to Allah’s will. Moreover, the way Shi’a observe Ashura is very similar to how Christians observe Easter; Shi’a gather for each of the ten days leading up to the festival of Ashura to hear a segment of the tragic story of what happened at Karbala. Similarly, on Maundy Thursday, Christians congregate to commemorate the final supper part of the crucifixion story. The theory of atonement for Shi’a is connected with this festival; the famous saying goes: “a tear shed for Husayn covers a hundred sins.” Part of the repentance ritual for Shi’a involves beating themselves, some zealots even flagellating themselves with whips and cutting themselves with knives; this is in order to both emulate his pain in death and in order to prove that they are not like the people of Kufa who did not come to Husayn’s aid at Karbala. Likewise, Christian atonement is through the martyrdom and resurrection of Jesus. The last great similarity is the universality of the human soul. Repentance in Christianity comes not in the wounding of the body but in the wounding of the ego through confession. Islam and Christianity share the importance of the individual in the universality of the human soul. The Qur’an teaches that “If anyone kills a person—unless in retribution for murder or spreading corruption in the land—it is as if he kills all of mankind, while if any saves a life it is as if he saves the lives of all mankind.” What you do to one man, in your heart of hearts you have done to all men; therefore, how important is this one man! This sounds awfully similar to Jesus’s teaching in the Gospel of Matthew: “Whatever you did for one of the least of these, you did for me… whatever you did not do for one of the least of these, you did not do for me.” Jesus equates the lowliest humans to the highest God—that’s how important the individual person is. Rumi, the thirteenth Century Islamic mystic and poet, rephrases this universal imperative in a different way: “You are not a drop in the ocean. You are the entire ocean in a drop.” Inside of each person is all of humanity and the Divine itself—or at least, this is how we ought to treat our neighbors.